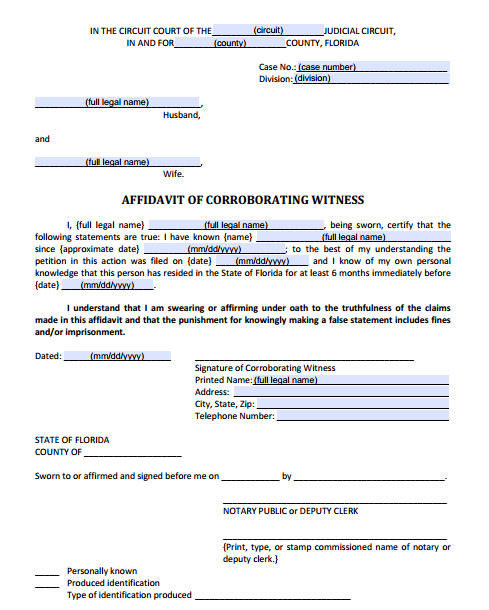 PDF Fillable Form 12.902(i) Affidavit of Corroborating Witness. This form may be used to prove residency in a dissolution of marriage proceeding. To get a divorce in Florida, either the husband or the wife must have lived in Florida for at least 6 months before filing the petition. This form is used to prove residency by affidavit. The person signing this form must know that you have lived in the State of Florida for at least 6 months before the date you filed your petition for dissolution of marriage.